My Father passed away on December 15th, 2013, he was 78 years old. On Wednesday, December 18th at one o'clock in the afternoon we had a beautiful memorial service honoring my father. The service was held on the shore of Lake Michigan at the Gilson Park Lakeview Center in Wilmette, Illinois. The Service was officiated by our friend, Rabbi Phil Lieberman and was attended by friends and family from near and far. 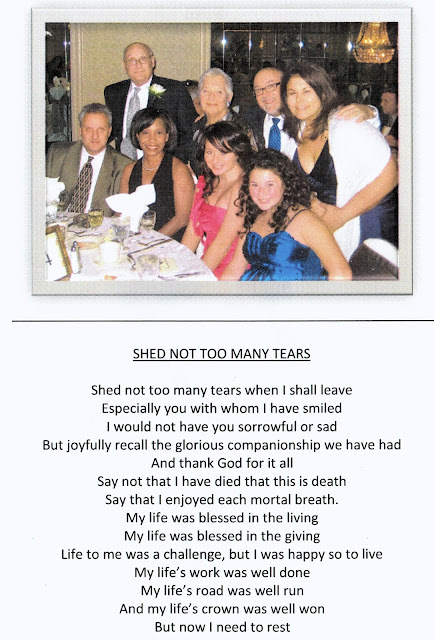 Below is his obituary, the program from the service along with thoughts from my daughter Jordie and eulogies my brother Jeffrey and I delivered paying tribute to our father. 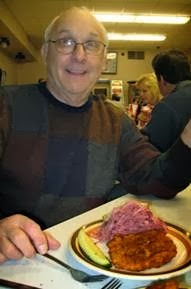 Walter A. Mallace "Wally", age 78. 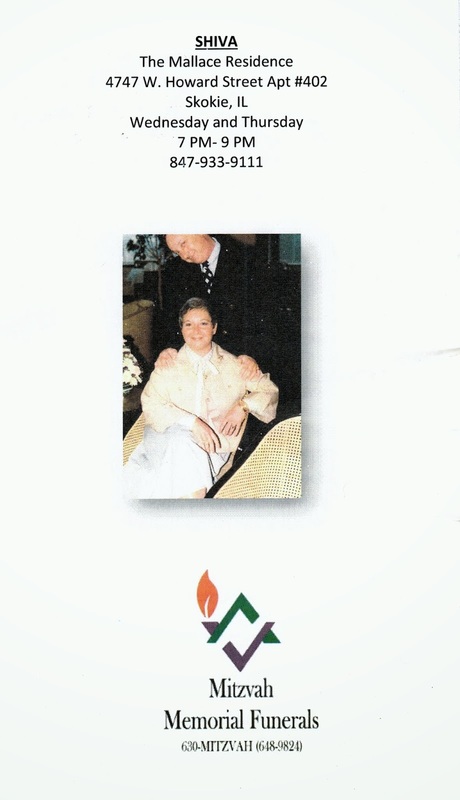 Life-long friend, partner and beloved husband for 57 years of Judy, nee Malkan. Loving father of Michael (Fran) and Jeffrey (Claudia) Mallace. Cherished grandfather of Jordie and Sydney. Dear brother of Fred (Barbara) Mallace. Fond brother-in-law of Bob and Sally Malkan. 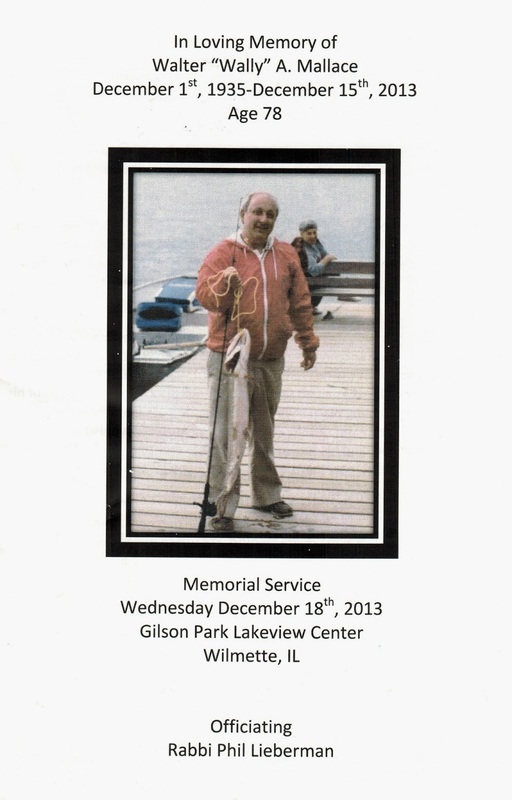 Memorial service Wednesday 1 PM at the Gilson Park Lakeview Center, 800 Gilson Park Drive, Wilmette. In lieu of flowers contributions in Walter's name to the charity of your choice would be appreciated. 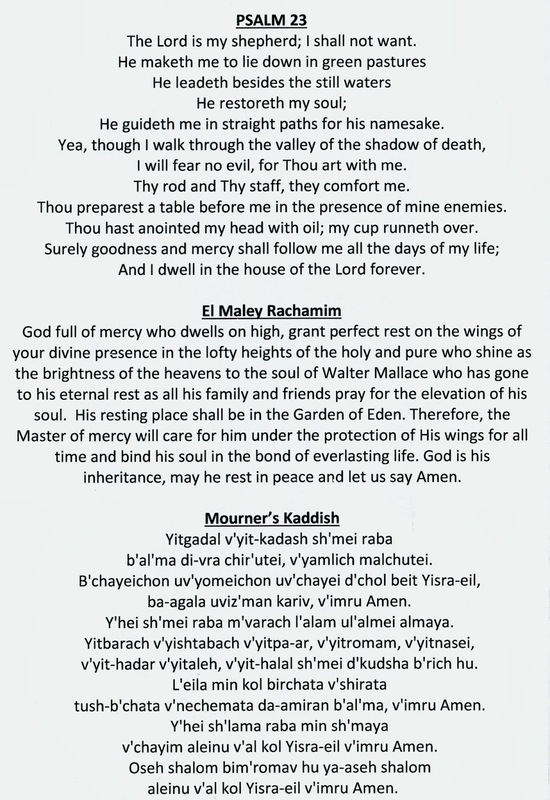 Info Mitzvah Memorial Funerals, 630-MITZVAH (648-9824), or www.mitzvahfunerals.com. While there were many stories to share, she selected the following favorites. She spoke about how she would do Math times tables long distance over the telephone with my father when she was younger, and her fond memories of the "Boys" trip (Jordie, my father and I) to Wisconsin where we went to visit my old Camp Horseshoe, Eagle River and Land O' Lakes where he went on family fishing trips as a kid and where we went as well. She went on to say how my father would not let her get a souvenir Greenbay Packers "cheese head hat" because Mallace's are Chicago Bears fans and that hasn't changed.. Go Bears! She also recalled the Children's museum in Chicago where she was the cashier and he was shopping for groceries and the visit to the Art institute of Chicago and her Harry potter obsession back then. Finally, she ended by saying how proud her grandfather was of her and how he would tell her she could do whatever she wanted to do in life. "A grandfather is someone with silver in his hair and gold in his heart"
Fran and I could not be prouder of how poised and in control Jordie was remembering her grandfather. My father, Walter Mallace, was a great man. He was dearly loved by my mother and his soul mate Judy of more than 57 years, my brother, and I, our wives, his granddaughters, along with his, brother, brother and sister in laws, cousins, nieces, nephews and countless friends. He was a second generation American, of German, Russian decent, born in the middle of the Great Depression on December 1st, 1935. His parents, Paul and Selma Mallace were a colorful couple from the south side of Chicago. At a young age he started working, first by selling eggs that his Aunt Mary and Uncle Jack would send him from their farm in Iowa. He had a very diverse and eclectic career as he worked his way through high school and college. He Sold orange pop at Soldiers Field. He did have a few career setbacks in his youth. He was an Ice cream man for one day until the warehouse that garaged the truck burned down, he was an elevator operator in a high rise office building for one day and had to quit because he got dizzy going up and down all day, he worked for a furrier for a few days but had to quit that job because he broke out in a rash when he was near the fur, he even delivered mail for a while. He hit his stride after leaving Roosevelt University when he started selling greeting cards for American Greetings Card Company. This laid the foundation for a long and successful, thirty plus year career as a the proprietor of Paper Plus, a card, gift and party supply retail store in the blue collar town of Waukegan, Illinois. Honesty, integrity, hard work, the highest moral standards, determination, fairness characterized my father. He was a thoughtful man who stood for what was right and the good things in life. He believed in the Golden Rule of doing on to others that you would want to be done on to you. These were not just mere words, but were the basic tenants that he lived his life by. He led by example and a had a work ethic second to none! These were the values, the guide-posts that were instilled in our moral fiber from our early days mopping the floors and emptying the garbage at the store in Waukegan. Quite simply, he was the hardest working man I have ever known. He always taught us right from wrong. That there was no such thing as a free lunch and that if you wanted something you had to work hard and smart and save for it. I remember when I was thirteen or fourteen he told me that I was not getting an allowance any more and that if I wanted money I would have to get a job. I angrily retorted, "At my age where am I going to get a job" His response was, "I guess you will have to come and work for me at the store on Saturday's." I was not happy, but worked for my dad from that point on until I moved to Arizona to go to College. My father was also very good at framing issues and putting them into perspective as well. I fondly remember the time I asked for a raise from my meager three dollars an hour salary. Without missing a beat. This was his response. "How many bosses do you know of that will wake their employees up in the morning, drive them to and from work each day and buy them lunch" Needless to say, I didn't get the cash. Although, What I didn't realize at the time and not until years later was that he really did give me the raise. There is an old saying, "You can give a person a fish and they can live for a day. Or you can teach a person to fish and they can live a life-time." I will cherish those Saturday's, the forty-minute drive we spent together each way to Waukegan and back. I will always be grateful for the wisdom my father shared with me as teenager. My Saturday's in Waukegan represent the most fruitful fishing expedition I've ever been on. Loyalty and friendship were paramount to my father. My father was always great with numbers. He could do calculations in his head faster than most people could do using a calculator. It is no surprise that he parlayed that skill set and liked to play cards with his buddies when he was a kid. To the very end, he still played Poker and Gin Rummy with some of the same gang from high school, Sunday school, college along with new friends he's made throughout his life. Here are some Wally fun facts. In High School, He was thrown out of home-room one day and sent to the Principals office because he was reading the racing form in the back of the auditorium. It gets better, to add insult to injury, my grandmother was called to school because of the issue and she got into a car accident on the way and smashed her brand new Red Cadillac on the median in front of Hyde Park High School. Of course it was my fathers fault that she hit the median, because my grandmother was so upset and could not concentrate. He loved to fish and especially loved going to Wisconsin on annual summer vacations with my grandparents, aunts, uncles and cousins. In high school, He would borrow his Uncle Phil's car when he wanted to go out on a date. He was an exceptionally devoted son to his mother and father. As a child my father was stricken with many ear infections, causing him to lose his hearing as a young adult, those were the days before antibiotics. Ironically, while he had difficulty hearing, he was a great listener. At twenty-nine, with two young boys, he suffered his first heart attack and was in the hospital recovering for months. By age fifty-five he had his first bypass surgery and ten years later he had his second bypass surgery, after that he had a kidney removed and along the way he was diagnosed with diabetes and lymphoma. Aunt Merle affectionately called him Felix the Cat because he had nine lives. He actually had a lot more than that. My father was brave, always positive, courageous and a fighter. He always looked at life as the glass being half full not being half empty. He and my mother faced his health issues head on and never swept them under the rug. Interestingly enough his father was a prizefighter, a boxer. He was tough and instilled those instincts into my father. The twelve rounds my father fought were not in the ring but in life regarding his health. If you would look at him or you were with him, he was always in good spirit and put his best game face on. He never let his health condition get in the way. People would ask me, "How's your dad doing?" I would respond, "He's great, but when you look under the hood, there are some issues." He always preached to my brother and I to never quit. I can tell you unequivocally, He practiced what he preached down to his last breath. He fought a great fight. As sad as this is, I don't look at his passing at 78 years old as a defeat, I look at it as a victory, a huge victory! He defied the odds. He was with us a lot longer than even he thought he would be. He won! and we also won, because we were all blessed by his presence and influence. Finally, I want to tell you about a true love story, the story of my mother Judy and father. Here is some more interesting Mallace trivia. 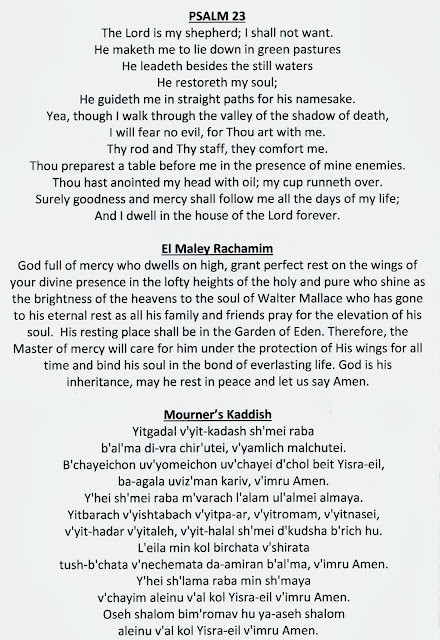 My mother's maiden name was Malkan, my parents went to Sunday school together, they were confirmed together and went to High School together, their pictures were next to each other in the Hyde Park High School yearbook, because Malkan was next to Mallace. As my daughter would say, "How Cool Is That!" They were destined to be together! The story goes, that after high school my Aunt Carol, my father's cousin and my mother's friend, fixed them up on a date. After the date my father asked my mother out again and again. By the fifth date my mother was a little frustrated that my father had not kissed her and she told Aunt Carol that she was going to kiss him if he didn't kiss her. The rest is history. Their marriage was solid. I'm sure that there were ups and downs along the way, but it endured for fifty-seven years. It was built on trust, honesty, mutual respect; it was a partnership at home and in the business. But most importantly it was build on unwaveringly love for each other. Mom, if dad were standing here now (and I believe that he is), I know he would tell you how much he was in love with you and how much he appreciated the way you looked out for him and you cared for him. You were his champion; his advocate and you selflessly gave of yourself to make him comfortable when you knew he was hurting. You were his, lover, his rock, you were there in the good times and the challenging times, you laughed together and you cried together, you were best friends! Mom, I hope you can take comfort in knowing that he fought to the end for you, and that he was at peace. Mom,.. dad thanks you and so do we! Finally, my brother Jeff has so eloquently stated, Walter Adolf Mallace will be missed, but he will not be forgotten. Thank you for being here today. It means a lot to my Mom, Me, and our Family. Michael did a wonderful job describing our Dad and his Life. I wanted to take a few minutes to share a few stories about our Dad, A Man I called MAX. Some of you may now be confused, because the program says Walter and Wally in Quotes. One thing my Brother did not mention was that our Dad was very Big on respect and discipline. We ate Dinner together as a Family at 6:15p.m. Every night. That’s when our Dad would pull in the driveway from work and Dinner would be on the table. He always asked us about school, my sports, Michael’s radio, and told us what went on at the store that day. So now you know the background, Here’s how the story goes. The Four of us were sitting in the Kitchen having Dinner. My Dad was sitting to my right and I said Dad. No response. I said Dad. No Response. I said DAD! No Response! If you recall, most of you know that my Dad was hard of hearing. Finally, I said “Hey Wally”. Well, Somehow he heard that. Before I knew it, a loving yet firm back hand to my cheek. My Dad said, you call me Dad, you call me Father, you call me Sir, but you don’t ever call me by my first name. I don’t know where it came from but immediately I responded “OK MAX” and as the words rolled off my tongue I was bracing myself for another Love Tap to the Cheek. My Dad looked at me smiled and it was MAX ever since! Back in the day when we wrote letters it was Dear Mom and MAX. Envelopes where addressed Mr. and Mrs. MAX Mallace. Gifts of Belt Buckles and Pocket Knives, engraved with MAX were given. And even today, Our Dad’s legacy lives on with his email address.WWW.MAXCHICAGO.COM. MAX’s impact has touched all of you here today and many others. I describe him as selfless, caring and compassionate. Humble, Funny, Loving and Proud! He was especially Proud of Michael and me. I think most of you know that I work for Frito Lay. I will be in my 29th year and my Dad has s been there from Day 1 to teach me, coach me, and counsel me. Last year Our Region won Frito Lay’s most prestigious sales award. It’s called the HW Lay award, named after our Founder. Every week MAX would ask me “how is your district doing”. I told him it was a Region and we were going to win the award. We did win and He was so PROUD and EXCITED, almost as if he were also on the Team. In my mind He was on the Team and will always be on the Team! There are Five things I’d like To share with you about my Dad. 1.) He always asked me as a Kid If I owned stock in Commonwealth Edison. I guess we were always leaving the lights on. 2.) He always told me. “Jeffrey, sit down when you eat…Relax.” To this day when I’m standing in our Kitchen, or eating something on the run, I hear this voice in my head…”Jeffrey, sit down when you eat”. 3.) Stand up Straight! This is really good advice for a 5’6 Man. 4.) Always save for a rainy day. Max always said he was coming to me when he needed a loan. That day never came. 5.) He often threatened to move into Claudia and my House. I told him MAX, if you and Mom want to move in, No problem. You can sign over your Social security check, enter only through the garage, come upstairs when I say it’s OK, and Please make sure you turn off the lights. We don’t have stock in the electric company. Last but not least, it’s our House and if you’re going to live in our House, you’ll have to live by our rules. Sound Familiar to any Parents out there? My Dad touched so many people’s lives’ in so many positive ways. You may think of him as a Husband, a Father, a Father in law, a Grandfather, a Brother, a Brother in law, a Cousin, a Friend, Michael or Jeff’s Dad. A Smart Guy, One of the Good ones! I’ll always remember him as MAX…My Dad, My Friend, My Hero!